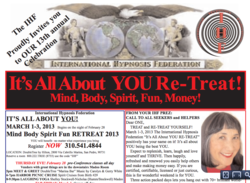 International Hypnosis Federation Conference on March 1-3, 2013, Los Angeles Area- Mind, Body, Spirit, Money and Fun Retreat of 2013. IHF Conference is one weekend of amazing explorations, fun, light-hearted and serious discoveries; this is a conference where participants learn new techniques for coping with stress, anxiety, depression, trauma, weight gains, smoking urges, self-hypnosis, NLP, Reiki, psychic tools, healing arts, and spiritual explorations; register now at http://www.hypnosisfederation.com/images/pdf/13confbrochuresm.pdf or 310.541.4844. Life Changing, Invigorating Conference on Mind, Body, Spirit and Money Tools March 1-3, 2013 Register at 310-541-4844. Tools of hypnosis and other treatments for losing weight, quit smoking, alternative healing techniques, energy work, spiritual investigations, pain, stress and anxiety relief, DNA change, channeling, psychics, Self-Hypnosis, NLP and more held at IHF "IT'S ALL ABOUT YOU" Conference March 1-3, 2013 Los Angeles Area. Register NOW at http://www.hypnosisfederation.com/images/pdf/13confbrochuresm.pdf or 310.541.4844. Dr. Carol Francis, a Keynote speaker explains, "International Hypnosis Federation Conference on March 1-3, 2013, Los Angeles Area, is the Mind, Body, Spirit, Money and Fun Retreat of 2013. IHF Conference is one weekend of amazing explorations, fun, light-hearted and serious discoveries; this is a conference where participants learn new techniques for coping with stress, anxiety, depression, trauma, weight gains, smoking urges, self-hypnosis, NLP, Reiki, psychic tools, healing arts, and spiritual explorations. Register NOW at http://www.hypnosisfederation.com/images/pdf/13confbrochuresm.pdf or 310.541.4844." The Retreat actually begins Thursday evening, February 28 at 5pm, with the Meet and Greet music of Carolyn and Gerry White; then from 6-7 pm an enjoyable harbor cruise and picnic dinner aboard the lovely “Spirit Cruise Ship.” Then back to shore for Dr Shelley’s Laughing Yoga experience. Throughout the weekend, keynote speakers include Hypnothoughts creator Scott Sandland, Mid-America Conference President, Carm Blaccionieri, Harvard Attorney and President of the California Hypnosis Union, Bruce Bonnit; The Sound Therapy Genius, Peter Blum; The brilliant Al Marotta; bestselling authors, Suzy Prudden, Roy and Joy Martina, Dr. Carol Francis and Dr. Shelley Stockwell and the European phenomenon, Martin Peterson, and WOWZA, her name speaks for itself. Spencer Humm will tickle funny bones when he hosts the Friday Night At The Improv Banquet with helpful characters like Ken, Vicky, Jeff, James, and Shelley and maybe volunteers too! Banquet includes Saturday Awards “Cirque Du YOU” Banquet Show honoring our humanitarian of the year; Dan Cleary. Music is with Picking, Jackson, Hale, and more. Pre and post certification classes are taught by some of the best professionals in the world. So come early and stay over for terrific opportunities to be on top of the world and on top of the game. Fabulous location… the DoubleTree by Hilton in San Pedro, California (2800 Via Cabrillo Marina, San Pedro, 90731 call (800) 222-TREE to book a discounted room).